As well as Pope Francis, whose verbosity is already the stuff of Catholic legend, other senior figures in the Church too are unshy of granting interviews on the current state of affairs within the Catholic Church. They do so now in a climate which could well be one that carries considerable risk to themselves. I really expect that few, if any, Catholic Cardinals, Bishops or Priests wish to be seen as in any sense wishing to contradict or oppose what the Supreme Pontiff teaches. What marks out a prelate like Bishop Athanasius Schneider, or Cardinal Raymond Burke, or Cardinal Robert Sarah from our beloved if sometimes contradictory Supreme Pontiff is the clarity of the message, but also the due reverence and respect they pay to the Pope, the Chief Shepherd of the Faithful, upon whom has been placed the task of feeding Christ's flock with spiritual nourishment. Bishops and Cardinals, however, also have this task of teaching Christ's flock. The internet, in particular, gives Bishops, Cardinals and Priests a particular opportunity to perform this ministry and we must be very thankful that the new media is being utilised to do just this, in a time when the Mass Media, while taking the lion's share in terms of conveying 'the message', does not have the monopoly. In the wake of the storm left by His Holiness's recent interview at 35,000 feet it was refreshing and heartening, as always, to read the common sense, unsensationalist and very reasonable Daniel Blackman interview with Bishop Athanasius. Like Cardinal Burke, it is very encouraging to hear and read of a Bishop's willingness to act as a correction on the exaggerations, distortions and mixed messages received when the Vatican and the Pope are so ready to engage perhaps somewhat recklessly with a mass media eager to present the Papacy as a purely political position with slogan or sound-bite teaching that threatens to undermine the Faith of the Church and the Faith of Christians everywhere. Authenticity is really a very important part of the Church. It is vital to the life of the Church, to what we believe and how we worship. We worship the authentic Christ, and when we worship an inauthentic Christ, we do not worship Christ at all. We do ourselves and others harm. Perhaps one problem with Pope Francis's style and delivery - the often confusing messages we receive from him, is that if a particular teaching goes against that which we have received - at least the catechised - then people will quite naturally go towards the Shepherds who are happy to simply pass on that which sounds authentic, that which is authentic, that which has been believed always, everywhere, by all Christians. The subtle weaving in of confusion and what a number regard as error in with truth will never satisfy or encourage in their spiritual life and growth those who ardently - or even tentatively - seek the Truth. The artifice, the pretension of so much of our modern existence pushes many towards a search for the authentic. I am so grateful to Bishop Athanasius and to other Prelates who are willing to stand up and defend the authentic Catholic Faith without apology - not wishing to cause offense or to scandalise those who should have the utmost respect for the Pope, but only to act as a correction on the excesses or excessive confusion that is bound to occur should a Pope open his heart, his mind and his mouth too willingly and with an unhealthy lack of regard for the effect these messages may have on souls, faithful and unfaithful alike. The authentic Catholic teaching on Christ's divinity and humanity, the authentic Catholic teaching on the Sacraments of Baptism, Marriage, the Holy Eucharist and Confession, the authentic Catholic teaching on life, love, sexuality. These are all so important to our growth as we wish to follow Our Lord and attain to everlasting Life, the supreme gift which Christ so wishes to bestow upon us, the gift of knowing and loving God that He has given to us by His Passion, Death and Resurrection. If any Churchman presents us with an inauthentic vision of the Catholic Faith - in any of its aspects - we have every right as Catholics to reject that vision. The Church has always been dedicated to verifying the authenticity of visions, apparitions and messages that people claim come from a Heavenly source. She tests the spirits, discerns what is true and what is false and has criteria for doing so. May God be praised that senior figures in the Hierarchy are willing to speak out and defend the timeless, authentic Catholic Faith from those who, lacking the necessary prudence that an occasion requires, may be seen to lead people away from the path traced by the Son of God. We are not Angels. We do not have their superior intelligence. We can be easily misled, easily confused, easily scandalised and quite easily believe or live a lie, but deep within us we do have a longing for absolute Truth, the Truth Who is Jesus, the Way, the Truth and the Life. We have an Enemy who wishes to sow within us discord, enmity with God and enmity with each other. He knows all our weaknesses, the ease with which we can be attracted towards a perversion or distortion of the good. Deep down, we want authentic relationships with others, we want to experience authentic love, not a worldy shadow or imitation of it and we ourselves want to love others authentically. We can, too, with His grace, love God with an authentic love and our neighbour as ourselves. We can earnestly seek authentic virtue and reject,and hate evil. We can love goodness and truth. We have been set free by the Precious Blood of Christ to love Him in return for the love with which He loves us, for He has loved us first. Perhaps you have been or are going to a 24 Hours for the Lord event in your parish, a now annual event of intimacy with Our Eucharistic Lord for which we can thank His Holiness Pope Francis in this time of grace and penance in preparation for Easter. Pray that more and more Bishops, Cardinals and Priests and Pope Francis leading the flock of Christ will feed us with the authentic Faith with zeal and with the charity of the Son of God. We need Shepherds and teachers set in authority over us who wish to share with the Church's children the authentic vision of Christ and the Christian life safeguarded and passed down the centuries for the Salvation of souls. We are called to imitate Christ. We are not called to accept a mere imitation or any false presentation of the Gospel. Bergoglio's admission that Europe is undergoing an Afro-Islamic "invasion" is surely a call to arms for the faithful Catholic. As Belloc said: the faith is Europe and Europe is the faith. If we fall, so too does the Church. Excruciatingly and obscurely, if not perhaps pusillanimous put, Bones. "If thy brother does thee wrong, go at once and tax him with it, as a private matter between thee and him; and so, if he will listen to thee, thou hast won thy brother. If he will not listen to thee, take with thee one or two more, that the whole matter may be certified by the voice of two or three witnesses. With all due respect for your well-written and beautiful article, a prayer really, it does not change the fact that our present pope invalidated the Sacrament of Confession, a precious given by Christ on Easter Sunday night. (See Gloria tv news 3-2-16, or the Pewsitter headline for March 3, 2016, or 1Peter5 right now.) It is a sad fact that Bergoglio's words on February 11, 2016 to the clergy of Rome constitute a direct attack on an essential element of our Faith. What will be next and who will defend God? Let us pray for our priests and bishops to do what Christ asks them to do. Bishop Schneider is outstanding. He seems not to be “afraid “ of the "Dictatorship of Relativism". His “ Proposals for a Correct Reading of the Second Vatican Council”, given at a conference of cardinals and bishops held in Rome, December 17, 2010, is a document which will be noted in the Catholic church 2/3 popes from now when we have the next Council to sort out the confusion in the Church. He has said that “we are in the fourth great crisis in the history of the Church, comparable to the fourth-century Arian heresy in which a large part of the Church hierarchy was implicated”. That also will be noted in the decades to come. A public heretic ipso facto is no longer Catholic. Bergoglio continues to publicly attack, mock and slander Christ and His Bride. PS @ Liam - do you and Bergoglio really share the same faith? Are you seroius when you call yourself and Bergoglio 'brothers in Christ?' 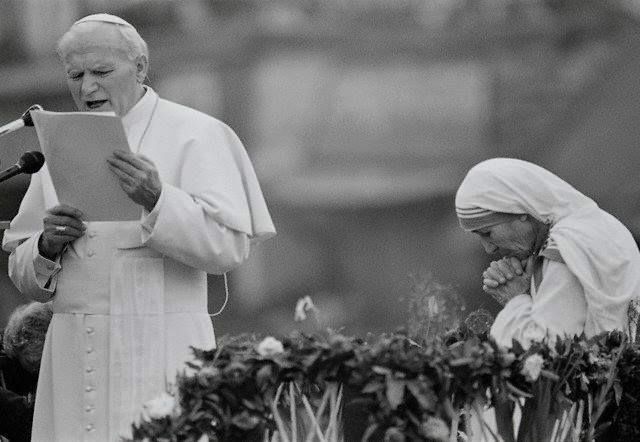 Do you believe in religious indifferentism (jpii and Teresa of Calcutta did)? Do you believe there is no hell? Do you believe the precepts of modernism come from Christ? To you believe in communion for public adulterers et al? Do you believe God's first commandment is not mocked world-wide when folks wearing Catholic clericals worship with Protestants, pagans and non-Christians? The list of antichrist teachings and practices goes on. I don't imagine you do share these aspects of 'the faith' with the VII heresiarchs; therefore, you have obviously agreed to diverge on matters of faith, which cannot be done 'in Christ'. The true popes teach us that even 'one degree' of rejection or disbelief in the doctrines of the Catholic faith, put one outside the Church. Every heresiarch since the sixties has rejected more than 'one degree' - much more. PPS sinners can be Catholics, but never heretics. Maybe I should have said "Sons of Adam". I apologize, Bones, for being so sharp with my critique of your thoughtful exposition. I should not have let my exasperation with this pontificate and the present state of affairs in the Church to well-up in totally misdirected criticism of what you have painstakingly offered for reflection. @ Liam. Yep, I think that would suit Bergoglio Inc.fine, so long as it stayed there. There are the Children of God and the Children men. VII knows no distinction - Christ being the distinction. Ad Beatissimi Apostolorum 1914 Pope Benedict XV, "Such is the nature of Catholicism that it does not admit of more or less, but must be held as a whole or as a whole rejected..."
He is Victorious! He is Risen! The Church and the "New Realities"